« Carbon Credits reach their true value! 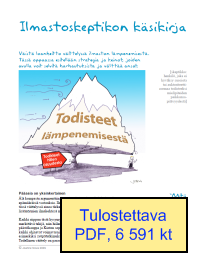 Ilmastofoorumi ry on julkaissut suomennokset australialaisen toimittajan ja kirjailijan Joanne Novan kirjoittamista The Skeptics Handbookista (Ilmastoskeptikon käsikirja) ja edellisen jatko-osasta Global bullies want your money (Ilmastokovikset haluavat rahasi). Palautetta suomennoksista voi lähettää osoitteella kasikirja.ei.roskapostia@ilmastofoorumi.fi. 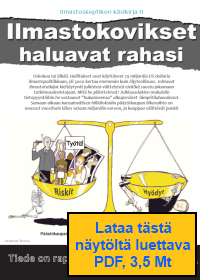 Käsikirjoista käytävää kommentointia ja keskustelua varten on erityinen ketju yhdistyksen keskustelupalstalla. The Finnish Translation of The Skeptics Handbook was announced here. Scandinavian countries really have a dynamic community. Interestingly enough, and even knowing of your site, I had forgotten to check out those who made the translations of your handbook. And so, I’ve discovered more sites, even one in Portuguese! Because English has become the de facto world business language, natural English speakers tend to assume that it is the only language that is important in world affairs. Spectacular mistake! And arrogant as well! The fact that volunteers will take the time and make the effort to translate your books into their own native language says considerably more about you and what you are doing than any pithy comment I could make here. It is a great credit to them that they have done so – they are our unsung heroes. Cant read the “Finnished Product” but good news. How many different languages now? There are so much of skeptical materials in English that I wonder why there is still a single person who isn’t skeptical in the English countries. Small nations, population of which equals a huge city, don’t have such access to skeptical information. While AGW propaganda is subsidized to produce a lot of translations the only volunteer translation projects are available for small countries population. There is also the effect that the emotional impact of the information is much stronger when it is in the native language. E. g. considering Czech discussions, people’s response is much stronger to information that is available in Czech including responses of the persons who know English well. They understand it to the point but the full emotional understanding by hart is better if you read it in your own language! In spite of the limited access to the Czech skeptical information most of the people in the Czech Republic is skeptical now. The main stream media also are growing to modesty. No one dared to write after this year floods it is due to AGW in a quality paper or in TV not to raise anger for such heynaism, which fosters a political propaganda with tragedy of flood inflicted people. Not so long ago, there was an article on the German-language EIKE web site about how insulated the German public are from the real discussion of climate science because they aren’t sufficiently-fluent in English. The translation of Jo’s handbook goes some way to explaining, but the availability of balanced, scientific literature is very poor; most published papers are behind pay-walls. And besides that, the tone of the language in many scientific papers is such that the ordinary Bürger simply switches off. It’s very hard work to wade through the technical literature and to understand it with just a basic appreciation of the underlying physics. It is very much like Sheldon trying to communicate with Penny in Big Bang Theory. This “literacy segregation” holds true in all languages, I suspect. There is a need for effective, balanced and hopefully unbiased science communicators in every language so that the level of understanding of just the basics can be ramped up among the population. I hope that the translation efforts amongst the community will develop into a critical mass; where more people with scientific training begin to fill the need to communicate “complex” ideas effectively with the wider population, especially in matters that will have a huge impact on their lives. It’s not complicated if somebody can explain it in a way that you can understand it. Don’t let Oreskes and the other babbling fools try to misdirect… the “science” of catastrophic, anthroprogenic climate change via CO2 is wrong because of simple reasons. P.S. It’s fantastic to see the Handbook finally being rated like a nuclear weapon; in kilotons. Translating science papers into something that the general public can understand would be a big step forward. The corruption of science is unfortunately making this necessary. Jo is doing a great job highlighting the results and issues from lots of papers but, as a true sceptic, i would like to read these papers for myself. Approved, detuned versions of science papers would also allow a much bigger percentage of the population to be better armed when politicians talk porky-pies! We can no longer rely on ‘experts’ to provide honest statements, assessments, etc and there is a chasm between the knowers and the know-nots. Despite being technically orientated, I have relied heavily on the assessments made by the regulars on Jo’s blogs as being true and accurate. I have often had to deduce this because the replies by their opponents are less believable or are at odds with some of the facts that i am aware of. However, mine is obviously not a scientific approach! I would like to be able to read a version of a paper that is clear and accurate in public-speak. I know this is very difficult partly because science, like in many realms of life, has its own language but Jo’s blogs and the contributors show that this is not insurmountable. Who would write these? Should the author nominate the writer or expressly not? Clearly the author must approve of the detuned document and the writer must be knowledgable enough to understand the scientific paper. Maybe there could be a pool of eligible writers? A commercial journal (new or existing) could pay the writers from the proceeds of the journal? What do you think? This should also make it harder for the obfuscators to do their damaging work. How many people walk away thinking ‘maybe there is something to it …’ when there really isn’t? That appears to be a major purpose of the trolls. 150 years ago scientific papers were written in plain English. There were almost no professional scientists – just keen amateurs. Yes, i agree. 150 years ago I would have expected science to be explained in plain english. Over time, as things get necessarily more complicated, the scientific language has to also, unfortunately for the public, become complicated and unreadable. We need a half-way house version of science papers.